November's update brings you a Buchschmid and Gretaux coffee table decorated with an inlay depicting a view of Heidelberg. We have seen quite a few B & G coffee tables before, but never one with a view of Heidelberg before. This may indeed be a 'one off' but we do know B & G usually produced runs of ten pieces at a time due to the packet cutting methods they used for cutting the designs from the veneers they used for their wood inlay work. 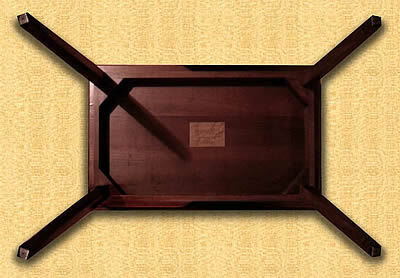 Our November update brings you an example of an unusual B & G coffee table. 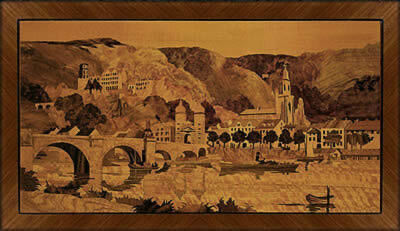 It has a view of Heidelberg as seen from across the river Neckar on its upper surface. These photos were sent in by Jill Arrazattee, but unfortunately there was no text to accompany the photos. However, we have checked through our records of B & G coffee tables and we have to hold our hands up and admit that we cannot find any record for the view of Heidelberg being depicted on a coffee table. We know they made special orders from time to time, so we must assume this coffee table originated from that special category. The requisite BG logo is in place and is located in the lower right hand corner of the picture. 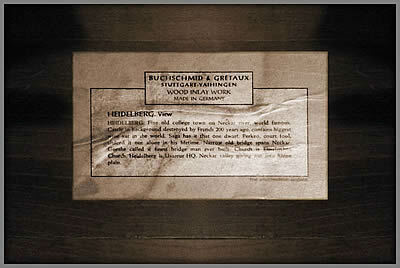 We have seen this label attached to the back of B & G Heidelberg pictures many times, but this is the first instance we have seen of this subject and label being associated with a coffee table. It is of course possible that there are other examples of this table in existence. If you have one perhaps you would like to photograph it and send us a copy as an email attachment. The border around the picture has been cross banded, so it is possible that the picture has been attached as a single piece complete with the border. The aspect ratio is different to the normal version of this picture, so this adds to the intrigue! Click the above button to return to page 49 of "Can You Help"